The joys of modern communication. Does your tax return need a second look? Tax Court disallows estate exclusion of family partnership transfers. Basis consistency report deadline extended again. Loan guarantees for IRAs were prohibited transactions. Surviving spouse doesn't "inherit" her deceased husband's minimum tax credit. Franchise Tax Board refund processing issue. Watch for erroneous California practitioner account notices. Employees working nontraditional shifts might be entitled to more paid sick leave. Damages limited in California tax harassment lawsuit by Nevada resident. Visit our new article: No B.S. Guide to Maximum Referrals & Customer Retention. 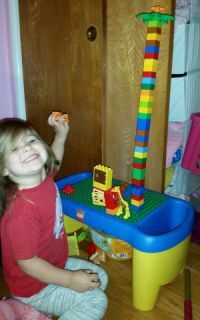 My granddaughter, Minerva Siemer, with her tower. This year, Mother's Day falls on Sunday, May 8. Remember to express your appreciation to your mother (and other influential "mothers" in your life). We just had a cool new telephone system installed. When the cutover to the new system was done, something happened and our T-1 line (internet connection) stopped working. It took almost a week to resolve the problem so we were without telephone, internet and email services for almost a week. The good news is we were able to catch up with some old chores. The bad news is people weren't able to contact us. We apologize for any inconvenience to you. The situation was beyond our control. My daughter, Holly Baker, and her husband Dan are celebrating their wedding anniversary this month. Congratulations Holly and Dan! They have a wonderful restaurant, MarchÃ© Aux Fleurs, in Ross, California, featuring patio dining during the spring and summer. Why not give them a try? Their web site is marcheauxfleursrestaurant.com. There's an old story about two barbershops having a price war. Finally, one of the barber shops posted a sign, "$2 haircuts fixed, $10." If you have an uncomfortable feeling about tax returns prepared for you last tax season (especially with stock option transactions), it might be worthwhile to let us have a second look at them. Call Dawn Siemer at 408-918-3162 on Mondays, Tuesdays, or Thursdays to make an appointment. An individual transferred marketable securities to a family limited partnership, and transferred interests in the partnership to her children. After her death, the IRS included the transferred partnership interests in her taxable estate. The Tax Court ruled in favor of the IRS. The Tax Court found there was an implied agreement that the decedent retained the right to the possession or the right to the income from the transferred property. A provision of the Surface Transportation and Veterans Health Care Choice Improvement Act of 2015 requires that the basis of property acquired from a descendent not exceed the value for purposes of the estate tax imposed on the decedent's estate. A report is supposed to be filed within 30 days after the estate tax return is due. The requirement applies for estate tax returns due after July 31, 2015. The IRS has administratively extended the due date for the report from March 31, 2016 to June 30, 2016. A husband and wife transferred $432,000 from their employer's pension fund to a self-directed IRA. The self-directed IRA purchased all of the shares of a corporation for $431,500. The corporation purchased the assets of a business for $602,000, including a promissory note for $200,000. The IRA owners personally guaranteed the note. An individual exercised an incentive stock option, resulting in an alternative minimum tax and a minimum tax credit. The individual later married and filed joint income tax returns with his spouse. Several years after his death, the surviving spouse tried to use his minimum tax credit to reduce her regular tax liability. The Tax Court upheld the IRS in disallowing the minimum tax credit. Spouses are individual taxpayers, despite being able to file joint income tax returns. Since the alternative minimum tax was incurred before marriage, it expired at the death of the deceased spouse. During the first couple of weeks of April, the Franchise Tax Board reduced refunds because fourth quarter withholding data was missing from their system. The problem related to W-2 payments and 1099-R payments. In addition, the Franchise Tax Board issued about 60,000 Forms 4734D, requesting a copy of the taxpayers' Social Security card, year-to-date paystubs and 1099s. The transmittal letter said a failure to respond within 15 days would result in a "denial of the taxpayer's request for refund." Although the Franchise Tax Board will hold the taxpayer's refund until a response is received, the refund will be issued when the information is provided. The refund may be delayed until up to two months after the information is received by the FTB. Form 4734D is issued when the Franchise Tax Board suspects there may be an identity theft problem with the taxpayer's account. Some taxpayers have received notices that state they have been added to a practitioner account that they did not authorize. If that happens to you, contact the Franchise Tax Board and request that your information be removed from the unauthorized account. The California Labor Code requires most employers to provide at least "24 hours or 3 days" of paid sick time per year to their employees. The requirement is for the greater of 24 hours or 3 days. For example, if an employee typically works a 10 hour shift on a workday, his or her employer would be required to provide at least 30 hours of sick time. Gilbert Hyatt was awarded $250 million in punitive damages and $139 million in compensatory damages from the California Franchise Tax Board by a Nevada court. Hyatt claimed the California Franchise Tax Board harassed him in a claim that he was subject to California income taxes because he didn't actually give up his California residence when he moved to Nevada. The U.S. Supreme Court ruled that, under Nevada law, Hyatt's damages are limited to $50,000. The issue of Hyatt's residency for the years in question still hasn't been resolved, and is likely to be settled. June 17, Sharon Lacy, CFPÂ®, CPWAÂ®, United Capital Financial Advisors, "Social Security basics"
June 24, Sharon Lacy, CFPÂ®, CPWAÂ®, United Capital Financial Advisors, "Social Security concerns for married couples"